Ploy to target eminent rationalist Prof Narendra Nayak? 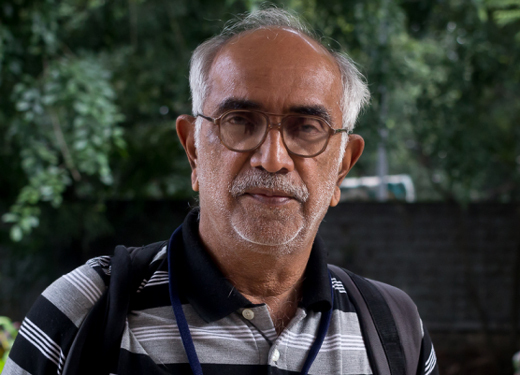 Mangaluru, June 14, 2018: In what is believed to be an attempt to target eminent rationalist Prof. Narendra Nayak who is in the forefront of the fight for justice in the RTI activist Vinayak Baliga death case, a CCTV camera near the apartment building where Prof. Nayak stays has captured images of an unidentified person enquiring with the security guard about the rationalist. The incident took place near Ladyhill where Prof Nayak stays and the CCTV footage shows the man leaving the spot in a haste when the security guard grew suspicious about his intentions. Prof Narendra Nayak says he is unaware who the person is and adds that the police has to look into the same. He said he has written to the City Police and the state Government following the threats he has been receiving in the backdrop of his fight against illegal activities and human rights violation cases. He also alleged that there were many organisations which are conspiring to eliminate rationalists.